KAMPALA– Apollo Okello, 52, stands in his garden pondering his next move. He looks at the sun above the sky but could not stop it from shinning. That afternoon he had expected rain to give life to his cotton but it did not come. Across in the neighbourhood, in Abwong B Village, Agali Sub-county, Lira District, many of his neighbours who have abandoned the growing of cotton also stood in their gardens bewildered by the failure of their cotton. Okello says in the past cotton was a cash crop which many families looked at for bailing them from poverty, for paying tuition for their children and doing other businesses but that today the prices of cotton make many farmers abandon it for other crops. He explained that cotton was once a cash cow in Uganda where growers aspired to out-compete each other in the acreage covered and income earned and that today cotton is slowly becoming a crop of the past with great decline in its production across the districts that used to grow it. He revealed that it is on record that Uganda produces the World’s best quality cotton but that the low prices of cotton that now fluctuate between Shs300 to Shs600, with generally high cost of producing cotton amid competing options to the level that the revenue gained from cotton goes towards production costs compared to other crops. The rather frustrated Okello noted that the cotton production has been falling on account of low yields and sometimes abandonment of the crop by the farmer due to low prices. Okello is not alone, across the country in Nebbi, Teso, Karamoja, Bugisu, Bukedi, Western Uganda, Busoga and Masaka sub-regions, farmers have abandoned growing cotton due to the low prices of Cotton. Dominic Etelu, a farmer and former chairman of Soroti District Farmers Association, from Serere district, a traditional cotton growing area in eastern Uganda blames the decline in cotton production in his area on the high costs of chemical pesticides and weeding and yet the prices are low. “I have stopped growing cotton because it does not make economic sense and I bet if farmers still growing cotton cost their labour, they will abandon cotton cultivation and shift to alternative crops like groundnuts and sorghum, which are less expensive to cultivate and their prices are high,” said Etelu. He explained that in the 1980’s, the price of cotton at the farm-gate was paid by the ginneries – co-operatives in most cases – but the government would also provide a subsidy. “This system always encouraged farmers as a good price was always guaranteed by government or ginneries and today the farmers are at the mercy of middlemen something that brings the prices so low,” said Etelu. Dr James Okoboi, the secretary of the North Bukedi Co-operative Union (NBCU) in Mbale Municipality known for cotton growing says the prices of cotton have discouraged most farmers from growing cotton. NBCU was established in 1958, the union was meant to focus on the growing, ginning and marketing of cotton in the districts of Budaka, Palliisa, Kibuku and Mbale, among others with about 40,000 members. “We at least 85 percent dormant members because cotton growing in the areas has dropped and the union faces financial constraints as it struggles to pay off debts that it can’t sustain the needs of farmers – like good prices,” says Mr Okoboi. Mr Okoboi adds that the country has seen a swift paradigm shift to a new gem of crops that are priced well and are now bringing economic transformation for many households, including affording formal education for their children. The data from the Cotton Development Organization says that the abandonment of cotton cultivation by farmers across the country and the reduction in acreage by those still growing the crop has caused Uganda to begin importing cotton products from elsewhere. Records indicate that Uganda currently imports up to 124 metric tons of absorbent cotton, with the lead importers being government agencies, national medical stores and joint medical stores and that Uganda is now the continent’s top importer of used clothing, though decades ago it was able to clothe itself. According to data from the Cotton Development Organization, Uganda’s lint production in the 1970s exceeded 450,000 bales. (A bale is 185 kilograms) and that in recent years, the highest amount of lint produced is barely 250,000 bales annually, occasionally dropping to 100,000 bales. 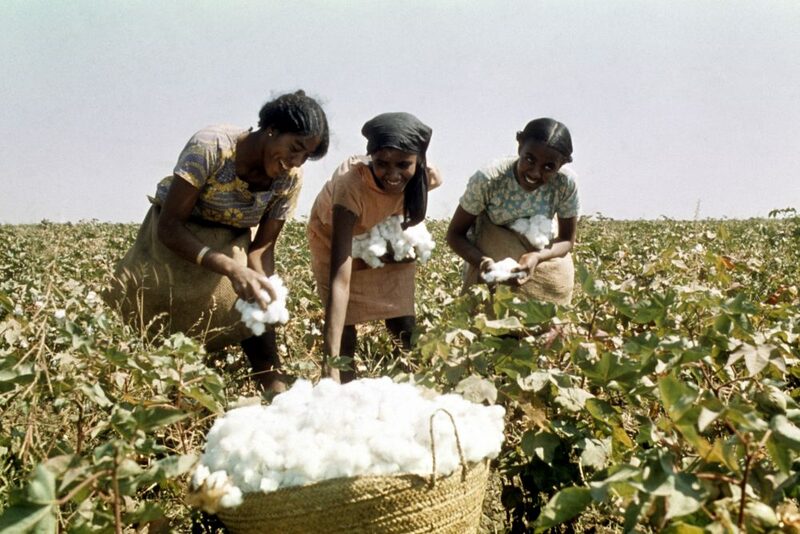 In April, the Economic Policy Research Centre (EPRC), Uganda’s leading economic research body, published research findings titled, “Developing Cotton by-products in Uganda,” which showed Uganda’s ginneries are operating at merely 10 percent of their optimal capacity. The findings further say that the downward spiral in Uganda’s cotton sector is primarily due to the high cost of producing cotton amid competing options. According to the same EPRC study, 40 percent of the revenue gained from cotton goes toward production costs, compared to 11-24 percent for crops like cassava, groundnuts, rice, sesame and sugarcane. Uganda’s Cotton Development Organization, a statutory body with a mandate to oversee the country’s cotton subsector, attributes high production costs to several factors and key among them are inadequate funding for research and technology development to respond to emerging production constraints; the high cost of imported inputs like pesticides and fertilizers; and competition for land and labour from other sectors, which has led to consistent fluctuations in production as farmers opt for other enterprises with lower production costs. Since then, however, the textile sector has faced more headwinds than anticipated. In Jinja, the former industrial capital of Uganda is Southern Range Nyanza (Nytil). The textile factory and Mbale textile industry – once a beacons of production in Uganda – are a shadow of their former selves with over grown grass dominating the factory premises, including the roof. What used to be a bicycle and car park for workers and shoppers is now almost like a grazing ground. Cows are seen making an occasional presence this area. Inside the factory premises, the building structures have peeling paint and cracked cement floors. It is a symbol of what has become of Uganda’s textile sector. Mr Vincent Ssempijja, the minister of agriculture, animal husbandry and fisheries however says that government is doing whatever is possible to ensure that cotton production is increased and that there are signs that it will improve. “As a result there was improved production of cotton in the country and its contribution to household incomes also rose from about UShs136 billion in 2016/17 to USh187 billion in 2017/18. Lint exports have also increased from about $ 39 million in 2016/17 to $ 49 million in 2017/18,” Mr Ssempijja said. Mr Ssempijja revealed that government has already [On Jan 17, 2018], through trade ministry signed a memorandum of understanding with SSA Investments, a Turkish company at the ministry’s headquarters in Kampala, to revive cotton growing and industry in Uganda. He said government will soon through Pader Cotton centre in Northern Uganda give out free seeds and pesticides to farmers besides tractors to revive cotton growing in Uganda. The Minister advised cotton farmers to increase on acreage of cotton saying that there’s market for their product since government has established a special fund to support cotton ginners to buy locally produced cotton from the farmers. Mr Opolot Okasaai, the director Crop resources at the ministry of agriculture said recently Uganda was selected by the United Nations Conference on Trade and Development (UNCTAD) to participate in cotton value addition project worth millions of shillings under the UN Development account, to improve the value added to cotton by-products in four countries, that is–Uganda, Tanzania, Zambia and Zimbabwe. He explained that in the financial year 2014/2015 Government established the Lint Buffer Stock Fund in 2014/15 to avail raw materials (lint) to local cotton textile manufacturers to support domestic value addition. “This Fund procured a total of 3,000 bales in 2016/17 and 11,500 bales in 2017/18 which were supplied to Southern Range Nyanza Ltd and Fine Spinners (U) Ltd for planting,” added De Opolot. He revealed that the demand for cotton in the country is expected to rise following launching of policies such as Buy Uganda Build Uganda; whose major objective is to promote local content and that under the garments, Uganda has huge markets for garments especially in the Education sector, security among other sector that procure volumes of uniforms for their staffs. SSA Investments is a business platform to make investments in textile manufacturing, agro-business and in healthcare solely to selected East African countries where opportunities should have strong development potential and export led growth taken as “modus operandi”.